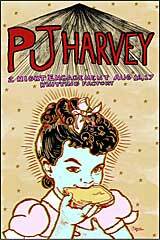 The Garden is an online community for people who share the love for PJ Harvey's music, created on February 26th, 2006. The idea behind creating this community was having a place for us, made by us. Where we could share and discuss information in an organized way. Where PJ would be the main star. We are constantly searching for improvement, in a group effort to find the most user-friendly structure and provide an environment where our members can interact with people from all over the world and talk openly about everything, PJ related or not. We hope you all enjoy your time here, and feel free to contribute to this place with whatever you can, even if that's simply your attention. Questions, suggestions, opinions and everything else are always welcome. If you'd like to introduce yourself, you can do it at the Meet the Gardeners thread - where you can also get to know the other members better - or start your own thread in the general forum Stories from the City. The History of The Garden... and all of its homes. When I started the forum I had no knowledge on how to do it by myself or resources to invest, so I chose to do it on free forum hosts. After a brief attempt at Armleg, I settled down at ForumsPlace, where the forum began being run conjointly with the original team and the addition of two staff members who are now administrators. At some point navigation on ForumsPlace became pretty much impossible, so we were forced to leave and restart from scratch. FP did not offer a backup, so unfortunately all members were required to re-register and the content posted there couldn't be transported. Eventually the whole service was shut down. So we moved to Forum5. The service was very good, and one of the main reasons we chose it was because it offered a backup. Unfortunately, what we did not know was that the service was going through what seemed to be changes in command. Up until this day they never clarified what happened. If you've been a member since 2008 you might remember a huge crash that caused a downtime for around a month. After that, the place seemed to be abandoned, only set to run smoothly (we assume for advertisement revenue purposes) but with no support whatsoever, and worse - with no backup. We did pay for the backup access, but were denied and got no response when trying to find a way around it. Due to the risk of one day waking up and realizing the forum was gone, aside from not having any autonomy to control our own fate, we decided the best thing to do would be starting again from scratch. Currently we are running the forum on our own dedicated web space, which means we have full control on what happens here, backups and consequently the possibility to move out without having to leave anything behind in case it's ever necessary. As you can see it's been a long and stressful road, but we've finally found our permanent home and we can assure you this is definitive. We apologize for the inconvenience throughout the years and we truly appreciate the patience and support of the members who've followed us here. We ask you to keep in mind this is our first time running the forum completely by ourselves. Only recently Hell and High Water managed to put it to work, and we're still learning the technical aspects of it. We don't know about matters of stability and how it will behave when we start having real traffic, so we ask you to please be patient in case of problems, and remember this is all part of a long-term plan to have the best possible site. We are leaving an open forum at http://thegarden.forum5.com/viewforum.php?f=12 . In case there are problems here we can talk there, besides of course through our usual communication channels. We also encourage you to copy whatever posts and/ or threads you'd like to have saved and paste them here. And don't forget to check the new (and old) board features! Posting features include quick reply, saving drafts, the new image posting and all smilies from the old Garden as well as the new ones. Boards features include different styles, subscription to threads, friends and foes list, thread bookmarking and probably others, so make sure to check the options under your User Control Panel. There were a number of things that converged at once that enabled me to do this. But the thing that got me started, was when the other forum went down for about 8 hours, it reminded me how vulnerable we are at the other host. When we moved there some time ago, the deciding factor was that they offered backups. When that didn't happen, we all felt frustrated and betrayed. Here, the host does backups I'm sure, but we can also back up everything ourselves. If for whatever reason we wanted to move, we could install the existing forum, all the posts, avatars, modifications and the domain name to a new host. I doubt that will happen, because in addition to that, I can call or even visit the office of the ISP and get things straightened out. So, for at least as long as I'm around, I think we're home. I don't see any reason to take the old forum down, but we'll see what happens as people move over here. There are still unknowns, if there are problems, please be patient. We'll see how things go when this place becomes active. LOL, and not only can I back up the database to the server, I can download a backup directly to *youknowwhere*! A geek's wetdream! Last edited by wickedtongue on Mon Aug 10, 2009 8:38 am, edited 1 time in total. Hi everyone great looking board cheers! Thanks guys, we hope to be here a long time! It's great being here. this time I found the quick reply function right away. You look reasonably happy for someone who's not. ^we were wondering who the hell Bloozzy was. This time we made it enormous just for you. I suspected such a thing. I feel so special and at the same time I worry that I'll be known from now on as the idiot who didn't see the quick reply function, back at the old garden. Terrible nickname. ^ Don't worry, you're not alone!